Parfait is a French word literally meaning “perfect” commonly employed to describe a kind of frozen dessert made of a combination of eggs, cream and syrup that is usually served in elegant tall glasses alternated with layers of fruit. 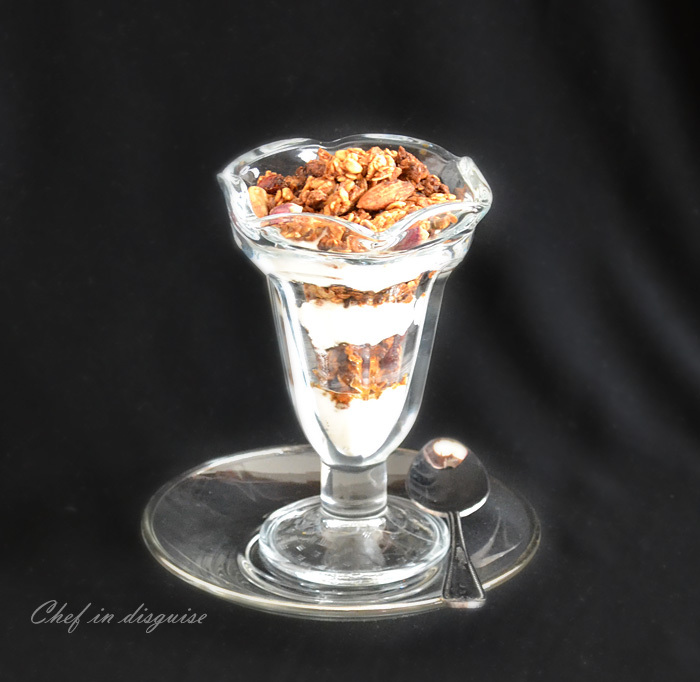 The best part about this yogurt granola parfait is that it is really quick and easy, it only takes a couple of minutes to prepare and if you serve it in a tall elegant glass it would make a great start of the day or a way to pamper yourself and feel special.Another great thing about this granola parfait is that it is versatile, you can vary the yogurt you use, the type of granola and the fruits you top it with, check out the notes for some yummy suggestions. You can vary the type of yogurt you use, plain, vanilla, strawberry flavored or you can flavor your own plain yogurt by whisking in some honey or your favorite preserves. 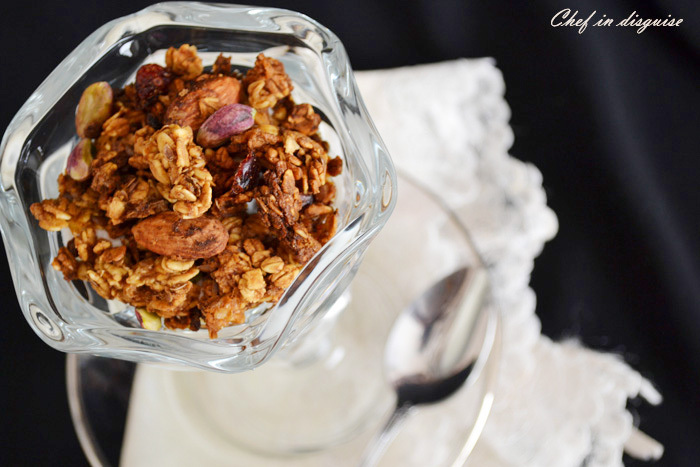 Posted in Breakfast, Vegetarian and tagged breakfast, food, Granola, healthy, homemade yogurt, quick and easy, summer recipe, tablespoon honey, vegetarian, yogurt parfait. Bookmark the permalink. This looks delicious and healthy too!!! These look absolutely incredible, Sawsan! Your first photo could be used to illustrate “visual appeal” in a photography lecture. This is a truly beautiful — and healthy — post. Well done! That sure looks elegant and yummy, would make a great mid-morning or mid-afternoon snack. This time of year, berries would be my choice of fruit for topping. This is perfect. Lovely photos! Looks amazing. Everything homemade makes it super yummy! First, let me say I hope you are recovering quickly from your burns… poor thing! I always have granola with yogurt instead of milk, never cared for the liquidy nature of the milk, making the granola a bit soggy. To me, nothing beats the combination of tangy yogurt with a slightly sweet granola on top. 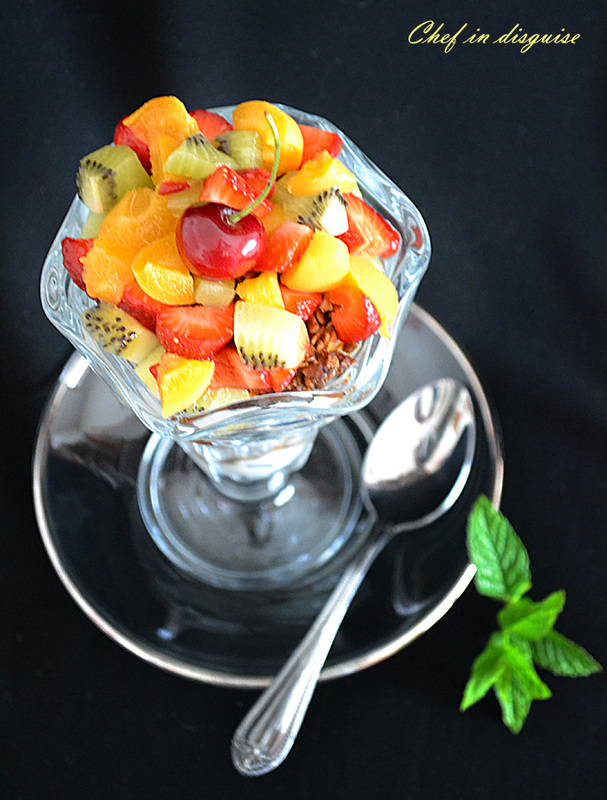 Your version, in layers, with the fruit… WOW! A wonderful combination – looks so colorful and satisfying! How easy it is if you just use a little bit of imagination! Looks appetizing from half a room away and sleep can still be in your eyes when you prepare it 🙂 ! You will not believe it Sawsan.. I was thinking of a granola yoghurt parfait all day yesterday.. and it was on my things to do to find a good recipe for granola!!! insane!! these look amazing.. i think it would make a great snack also.. for those times in between meals.. especially early evening!!! Wow that parfait looks delicious and healthy! The simplicity of this elegant dessert caught my eye, Sawsan. It is very beautiful and I can just imagine how lovely the creamy, smooth and tart the yogurt is against the crunchy and sweet home made granola. You used fresh fruit, but a sprinkling of dried fruit like dried cherries or cranberries would add yet another texture: chewy. I can just taste it. Simple and beautiful. I could see this both as a great breakfast and a healthy dessert! Yum. I love eating parfaits for breakfast. It’s SO elegant! Usually I just mix everything together in a creamy mess instead of making it look SO beautiful! Great parfait! This is so perfect for summer. I am embarrassed to say, 1) I didn’t know parfait = perfect, and 2) I have never prepared this easy & delicious dish at home. Sadly, in Japan parfait refers to more of dessert recipe with lots of sweet stuff in it (chocolate, whip cream to begin with), and I definitely didn’t think of making healthy version like this for breakfast. I LOVE this! I think it makes our morning very special. This is “perfect” just like its name! I’ve never seen a parfait look better than this does, Sawsan! Wonderful breakfast, brunch or snack recipe! Love the heap of fruit on top, especially. 🙂 Thanks for sharing! Very nice vibrant colors and full of yummy treats. Beautiful, fresh, delicious and healthy! Something I’d love to eat now… Perfect! 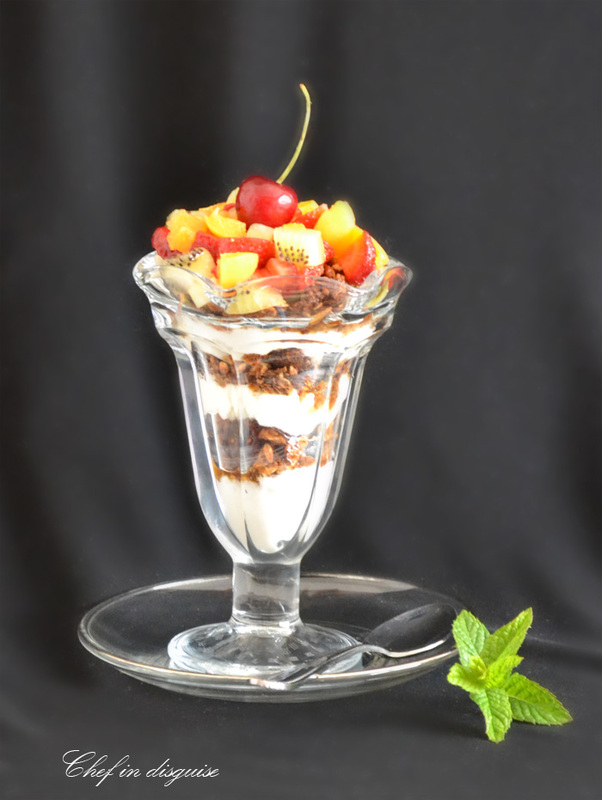 Great photos of a luscious parfait! Looks so refreshing for summer.